In 1986 the Wall Street Journal’s Carol Hymowitz and Timothy Schellhardt gave the world an answer: “Even those few women who rose steadily through the ranks eventually crashed into an invisible barrier. 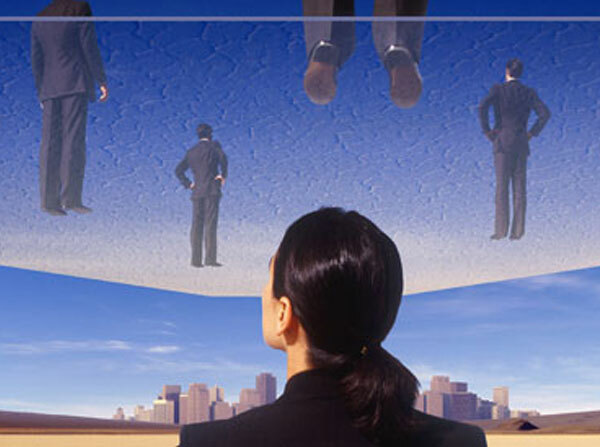 The executive suite seemed within their grasp, but they just couldn’t break through the ‘glass ceiling”. Glimpses of this glass ceiling are unanimously observed on the ladder of economic capacity building for women right from the labor sector to the domain of corporate governance. In a study over 440 men and women construction workers along with 51 building contractors, Annette Barnabas found that women hardly get to the role of a mason and are restricted to the job of passing bricks or stone here and there. The findings of the study reflect a strong bent of gender stereotyping. Unfortunately, even those women who somehow climb few rungs of the progress ladder and reach out to culturally feminine jobs like nursing, teaching, lectureship, librarianship or social work also stop at a particular point as even there, men lead the executive positions. Ironically, even in the top notch corporate governance, the Fortune 500 companies have only 6% women in their C-suite (the leadership roles starting with letter C like Chairperson, Chief Operating Officer, Chief Executive Officer etc.). The limitation of a female employee to work late in office or to go out for late night office parties or her need for maternity leave at the time of delivering the child or at times when someone is sick at home or even the male counterparts at work doubting her potential in policy making or use of technology or operating softwares such as ERP or CAD etc. are few examples of the metaphorical glass ceiling going practical. And unfortunately, it is not a talk of today but finds thorough existence in history of time. Jayadratha, Ashvathama, Duryodhana, Dushasana in the Dwapara Age, Ravana, Shatmukh Ravana, Dashmukh Ravana of the Treta Age, Nahusha, Shumbha, Nishumbha and Mahishasur in the Krita Age are varied examples of creators of glass ceiling as they all underestimated the potential of women by testifying women as weak and objects of desire. Let’s take for instance, case of Mahishasur’s battle with Goddess Durga, as mentioned in the Srimad Devi Bhagwat Mahapurana. The demon Mahishasur elated Lord Brahma through his penance and when blessed by Lord Brahma to ask for a boon, he demanded of a death only through a woman as it seemed next to impossible to him. Tasmanne Maranam Nunam Kaminyaha Kuyu Padmaj. Abala Hantu Katham Shakta Bhavishyati. Thereafter, Mahishasur attacked and defeated the Gods in heaven. Having the throne of heaven under his control, his worldwide tortures raised even more. It was then that all Gods devoted their energies to shape an effulgent form of energy with eighteen hands and a third (divine) eye at the forehead in the form of a woman. This was Goddess Durga! Just at a single glance of the beautiful Goddess Durga, Mahishasur was captivated by his own sensual clutches. Now, to acquire Goddess Durga as his own woman was his sole aim. For this, he sent many of his courageous fighters with a plea to Goddess Durga to surrender herself to their demon king. But, to their astonishment, Goddess Durga challenged Mahishasur for a battle with her and said, “I shall kill you with the effulgence of my eye”. Yayoktam Netrabanaistvam Hanishye Parthivam. It is noteworthy that Goddess Durga talked about her third (divine) eye which was mistaken by Mahishasur and his kins as mortal eyes symbolic of lust and they bought it as a proposal of sensual engagement from the Goddess. Finally, Mahishasur appeared in the battlefield and fought with the Goddess beauty in many forms. But, Goddess Durga beheaded the demon and ended the story of his life with her ferocious weapon. Ityuktva Darunam Chakram Mumocham Jagadambika. Shirashchhinam Rathagena Danavasya Tada Rane. The demon Mahishasur is symbolic of society’s ignorance. A society that fails to extend women her due respect and status. Goddess Durga with a third (divine) eye at her forehead is symbolic of an ideal woman in her full potential. By killing the demon Mahishasur, Goddess Durga not only protected herself and dignity of women but also acted as a change agent inspiring women over the ages. A change agent is the one who gathers strength and courage to stand against the existing inertia and by looking at him/her, others also get on to the same path of change ignited by him/her. Goddess Durga’s case leaves an inspiration for women to get their third (divine) eye ignited, reach their full potential and become change agents. Revival of such glorious culture of respect for women is possible even today; the only condition being the woman explores her unexplored dimension that is her third (divine) eye, which is the seat of self (soul or pure consciousness) situated at the forehead, to live her full potential. The process of self-realization empowers one spiritually as the true Self is the perennial source of divine energy. The definition of holistic empowerment of women with a set of educational, social, economic and political empowerments remains incomplete until it is complemented by spiritual empowerment. “Women! Don’t you forget, you are the embodiments of the same Goddess Durga! Know your worth! Ignite your potential! We wish you Happy International Women’s Day 2017!